This basic taxonomic unit is remarkably stable. Species tend to remain the same throughout their geological history. As noted by eminent evolutionist Stephen Jay Gould, the macroevolutionary patterns of species are typically ones of morphological stability during their existence, a phenomena known as "stasis." In presenting the theory of punctuated equilibria, Niles Eldridge and Gould noted: "Most species, during their geological history, either do not change in any appreciable way, or else they fluctuate mildly in morphology, with no apparent direction." Once a species appears, the fossil record does not change much during its existence, which may be several million years. This view accords well with the view of creationism, which references a clear-cut boundary between species, as well as stability during their existence. 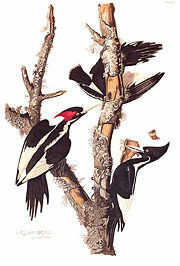 The ivory-billed Woodpecker (Campephilus principalis) is an endangered species. The concept of species is important. For one, environmental law is framed in terms of species. Indeed, many countries have laws proscribing special protection to species considered endangered to prevent their extinction. The term species also is central to evolutionary studies, and is generally presented as the principal unit of evolution. Ernst Mayr maintains that one cannot even write about evolution, or most aspects of the philosophy of biology, without understanding the meaning of the biological species. It is difficult to even speculate how many species there are on the planet today. Estimates range from 10 million to 150 million. Less than 2 million species (perhaps only 2 percent or less of all species) have been identified. In taxonomy, a species is assigned a two-part scientific name. The genus is listed first (and capitalized) followed by a species epithet (which is not capitalized). For example, humans belong to the genus Homo, and are in the species Homo sapiens. Tigers, lions, leopards, and jaguars are different species, but each are similar enough to belong to the same genus (Panthera). The name of the species is the whole binomial not just the second term of the binomial (the specific epithet). This system was set up by Swedish botanist Carolus Linnaeus. The scientific name of a species is properly typeset in italics. When an unknown species is being referred to, this may be done by using the abbreviation "sp." in the singular or "spp." in the plural in the place of the second part of the scientific name. Groups within a species can be defined as being of a taxon hierarchically lower than a species. In zoology, only the subspecies is used, while in botany the variety, subvariety, and form are used as well. It often corresponds to what lay people treat as the different basic kinds of organisms—dogs are one species, cats another. It is the standard binomial nomenclature (or trinomial nomenclature) by which scientists typically refer to organisms. It is the only taxonomic level that has empirical content, in the sense that asserting that two animals are of different species is saying something more than classificatory about them. After thousands of years of use, the concept remains central to biology and a host of related fields, and yet also remains at times ill-defined and controversial. Typological (or "morphological") species concept. Historically, species were viewed as collections of individuals that share a common phenotype, including morphology, behavior, and ecological relationships with their environment. This method was used as a "classical" method of determining species. For example, continental North American savanna sparrows were differentiated from savanna sparrows from Sable Island, Nova Scotia, if they were sufficiently different in morphological characters. A chicken and a duck can be distinguished because they have different shaped bills and the duck has webbed feet. This traditional method is useful in the work of taxonomy, such as cataloging species and creating identification keys. It is also applicable in paleontology, where morphology is all there is (such as snail shells in fossil beds). Indeed, the concept of morphological species remains the single most widely used species concept in everyday life, and retains an important place within the biological sciences, particularly in the case of plants. Shortcomings: However, there are also important shortcomings with the typological species concept of distinguishing species. For example, different phenotypes do not always constitute different species (i.e. a 4-winged Drosphila born to a 2-winged mother is not a different species). It is not uncommon to find pronounced morphological differences among individuals within one interbreeding population, due to individual genetic variation, sexual dimorphism (males, females, immatures), and life stage (catepillars and butterflies)—differences that may be much more evident than between clearly different species. Furthermore, there is the challenge of oversplitting taxa, whereby each variant is called a new species. Biological (or "isolation") species concept. This concept identifies a species as a set of actually or potentially interbreeding organisms. Or, as stated by Ernst Mayr, "Species are groups of interbreeding natural populations that are reproductively isolated from other such groups." The biological species concept (BCS), which developed in the second half of the nineteenth century and was greatly advanced by Mayr in the twentieth century, involves thinking of species in terms of variable populations rather than fixed types. This is generally the most useful and common formulation for scientists working with living examples of the higher taxa, like mammals, fish, and birds. Shortcomings: The BSC is meaningless for organisms that do not reproduce sexually. Furthermore, the key to defining a biological species is that there is no significant cross-flow of genetic material between the two populations. But, biologists frequently do not know whether two morphologically similar groups of organisms are "potentially" capable of interbreeding, and BSC is thus impractical in many instances of allopatric (geographically isolated) populations. The BSC does not distinguish between the theoretical possibility of interbreeding and the actual likelihood of gene flow between populations. Does one successful hybridization invalidate species distinction? Note that it is possible to cross a horse with a donkey and produce offspring. However, they remain separate species—in this case for two different reasons: first because horses and donkeys do not normally interbreed in the wild, and second because the fruit of the union is rarely fertile. Similarly, how does one utilize the BCS to delineate paleospecies (extinct or fossil species)? Mate-recognition species concept. A mate-recognition species is defined as a group of organisms that share a common fertilization system and are known to recognize one another as potential mates. Shortcoming: Like the BCS above, it applies only to organisms that reproduce sexually. Phylogenetic species concept. The phylogenetic species concept, which has several versions, essentially defines a species as a group of organisms bound by a unique ancestry. Devised by paleontologists Niles Eldredge and Joel Cracraft, it is an attempt to define species by their relationships to other species, involving uncovering their genealogical relationships. A formal definition given by Joel Cracraft is: "A species is the smallest diagnosable cluster of individual organisms within which there is a parental pattern of ancestry and descent." Thus, according to this concept, diagnosable geographic forms of the same basic "kind" of bird should be treated as distinct species, because these forms have evolved separately, and have unique evolutionary histories. For example, a population of sparrows that had a unique heritable character, such as a particular allele (form of a particular gene) would be considered a separate species from those that do not have that particular character. This method is applicable even to unusual reproductive modes other than sexual reproduction. Shortcomings: Application of this concept is problematic in those cases where morphologically different populations are connected by gene flow, and such morphological variation among populations is not uncommon within living species. For example, humans have substantial morphological variation from continent to continent. Fragmentary specimens collected by a paleontologist on different continents, which show clinal variation, would appear to be unique. Ernst Mayr also criticizes the phylogenetic species concept as nothing more than the revival of a purely morphological species concept. Evolutionary (or "Darwinian") species concept. An evolutionary species is a group of organisms that shares an ancestor; a lineage that maintains its integrity with respect to other lineages through both time and space. At some point in the progress of such a group, members may diverge from one another: when such a divergence becomes sufficiently clear, the two populations are regarded as separate species. This "evolutionary species concept" (ESC) is often associated with George Gaylord Simpson, a mammalian paleontologist, who stated "a species is a series of ancestor-descendent populations passing through time and space independent of other populations, each of which possesses its own evolutionary tendencies and historical fate." The ESC is the most popular concept among paleontologists, and is used extensively in comparative biology and phylogenetic systematics. It has similarities with the phylogentic species concept, but the ESC combines the genealogical basis of the phylogenetic species concept with the genetic basis of the biological species concept. Specifically, the ESC uses a wider range of characters to make the species determination. An evolutionary species is a lineage of interbreeding organisms, reproductively isolated from other lineages, that has a beginning, an end, and a distinct evolutionary trajectory (Wiley 1978). Shortcomings: Mayr criticized this concept for several reasons: (1) it replaces the clear-cut criterion of reproductive isolation of the BCS with such vague terms as "maintains its identity," "evolutionary tendencies," and "historical fate"; (2) it is applicable only to monotypic species, and geographic isolates would have to be treated as different species; (3) there are no empirical criteria by which evolutionary tendency of historical fate can be observed in a given fossil sample; and (4) the ESC does not help in the lower or upper demarcation of chronospecies, even though the concept was apparently introduced to deal with the time dimension. Ecological species concept defines a species as a group of organisms that share a distinct ecological niche. Shortcoming: This concept, which is based on the niche occupied by a species, is problematic because widespread species generally have local populations that differ in their niche occupation, which would require they be recognized as different species, even though based on all other criteria they would not be. As noted by Mayr (1996), "More fatal for the ecological species concept are the trophic species of cichlids (A. Mayer 1990)," which differentiate niche within a single set of offspring from the same parents. There are also common cases where two sympatric species seem to occupy the same niche. These are just a few of more than a dozen common methods of delineating species among biologists. (One might also include, for example, Templeton's "cohesion species concept" that attempts to combine several components of species concepts, but which is likewise criticized as failing to resolve the resulting conflicts.) In practice, these definitions often coincide, and the differences between them are more a matter of emphasis than of outright contradiction. Nevertheless, no species concept yet proposed is entirely objective, or can be applied in all cases without resorting to judgment. Given the complexity of life, some have argued that such an objective definition is in all likelihood impossible, and biologists should settle for the most practical definition. No one knows how many species exist today. Approximately 1.8 million species of animals and plants have been identified (excluding the diverse kingdoms of fungi, bacteria, and other unicellular organisms), but some biologists estimate there may be more than 150 million species of living things on the earth. Indeed, E. O. Wilson in his 1992 book The Diversity of Life, stated "How many species of organisms are there on earth? We don't know, not even to the nearest order of magnitude. The numbers could be as close to 10 million or as high as 100 million." 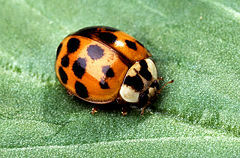 Of those that have been identified, more than half are insects (about 57 percent), and nearly half of all insect species are beetles, meaning that beetles, with over 400,000 identified species, represent about 25 percent of all named species in the plant and animal kingdoms. This fact led to the famous quip from J. B. S. Haldane, perhaps apocryphal, who when asked what one could conclude as to the nature of the Creator from a study of his creation, replied: "An inordinate fondness for beetles" (Gould 1993). There are also approximately 9,000 named species of birds, 27,000 known species of fish, and a ledger of about 4,000 or so mammalian species. These groups have been diligently catalogued, unlike insects, which rank among the most uncounted groups of organisms. Speciation is the term that refers to creation of new and distinct biological species by branching off from the ancestral population. Various mechanisms have been presented whereby a single evolutionary lineage splits into two or more genetically independent lineages. For example, allopatric speciation is held to occur in populations that become isolated geographically, such as by habitat fragmentation or migration. The isolated populations then undergo genotypic and/or phenotypic divergence. Sympatric speciation is held to occur when new species emerge in the same geographic area. Ernst Mayr's peripatric speciation is a type of speciation that exists in between the extremes of allopatry and sympatry. In parapatric speciation, the zones of two diverging populations abut but do not overlap. There is only partial separation afforded by geography, so individuals of each species may come in contact or cross the barrier from time to time. Polyploidy is a means by which the beginnings of new species are created in just two or three generations. For years, the prevailing evolutionary view involved the concept of "gradualism." This was a view of evolution as proceeding by means of slow accumulation of very small changes, with the evolving population passing through all the intermediate stages—sort of a "march of frequency distributions" through time (Luria et al. 1981). Darwin made frequent reference to gradualism in his Origin of Species. For example, he stated: "As natural selection acts solely by accumulating slight, successive, favorable variations, it can produce no great or sudden modification; it can act only by very short and slow steps. Hence the canon of 'Natura non facit saltum'…" He further stated that nature "can never take a leap, but must advance by the shortest and slowest step," and that "if it could be demonstrated that any complex organ existed, which could not possibly have been formed by numerous, successive, slight modifications, my theory would absolutely break down." However, recent models or theories have been developed that contrast with gradualism. These include punctuated equilibria, theories of punctuational speciation, and theories of rapid transitions. The theory of punctuated equilibria presents the view that the macroevolutionary patterns of species are typically one of morphological stability during their existence (stasis), and that most evolutionary change is concentrated in events of speciation—with the origin of new species usually occurring during geologically short periods of time, when the long-term stasis of a population is punctuated by this rare and rapid event of speciation. Crystallized and popularized by Stephen Jay Gould and Niles Eldredge, this view contrasts with what Gould and Eldredge saw as an a priori bias towards "phyletic gradualism," which was the terminology for the expected slow, steady, progressive transformation of an ancestral population into a new species. Such a transformation was to involve large numbers ("usually the entire ancestral population"), be "even and slow," and occur "over all or a large part of the ancestral species geographic range" (Eldredge and Gould 1972). This concept of phyletic gradualism was applied to the development of new species either by phyletic evolution (where the descendent species arises by transformation of the entire ancestral population) or by speciation (where the descendent species branches off from the ancestral population). According to the proponents of punctuated equilibria, the viewpoint of phyletic gradualism leads to the expectation that the fossil record should yield a gradually graded sequence of intermediary forms. However, the fossil record does not generally yield such a sequence of slightly altered intermediary forms, but instead the sudden appearance of species, and long periods where species do not change much. Notably, as a model developed to describe macroevolutionary trends, the theory of punctuated equilibria is not necessarily tied to any one mode of speciation. It can be affiliated with both allopatric speciation and sympatric modes, and is independent of whether natural selection is involved or not. Likewise, species may occur by gradual means, passing through all intermediate stages, or by rapid origin, such as in chromosomal speciation. It also does not exclude saltation initiation of major transitions. There are also punctuational models of speciation. This is a different concept from the theory of punctuated equilibria, in that punctuated equilibria refers to the macroevolutionary trend of stasis and rapid speciation, and punctuational models of speciation refer specifically to the mode of speciation. Punctuational models of speciation have been advanced in contrast with what is sometimes labeled the "allopatric orthodoxy." This terminology refers to the process of species origin involving geographic isolation, whereby a population completely separates geographically from a large parental population and develops into a new species gradually, until their differences are so great that reproductive isolation ensues. In this understanding, reproductive isolation is a secondary by-product of geographic isolation, with the process involving gradual allele substitution. Contrasted with this traditional view are the punctuational models for speciation, which postulate that reproductive isolation can rise rapidly, not through gradual selection, but actually without selective significance. In these views, natural selection does not play a creative role in initiating speciation, nor in the definitive aspect of reproductive isolation. Among these modes are "polyploidy" (where there is a multiplication of the number of chromosomes beyond the normal diploid number), and "chromosomal speciation" (large changes in chromosomes due to various genetic accidents). There are also models for the origin of new designs via rapid transitions (such as bird feathers from reptilian scales, jaws from jawless fish, etc.). Extinction is the disappearance of species (i.e. gene pools). The moment of extinction generally occurs at the death of the last individual of that species. Extinction is not an unusual event in geological time—species are created by speciation, and disappear through extinction. It should be noted that observation of many species over the years has failed to establish even a single instance of two diagnostically different populations that exist in sympatry and have then merged to form one united population. Without reproductive isolation, population differences cannot develop, and given reproductive isolation, gene flow between the populations cannot merge the differences. This is not to say that cross breeding does not take place at all, simply that it has become negligible. Generally, the hybrid individuals are less capable of successful breeding than purebred individuals of either species. Eldredge, N., and S. J. Gould. 1972. Punctuated equilibria: An alternative to phyletic gradualism. In T. J. M. Schopf, ed. Models in paleobiology (pp. 82–115). San Francisco: Freeman, Cooper. Gould, S. J., and N. Eldredge. 1977. Punctuated equilibria: The tempo and mode of evolution reconsidered. Paleobiology 3:115–151. Gould, S. J. 1993. A special fondness for beetles. Natural history 1:4–12. Luria, S. E., S. J. Gould, and S. Singer. A view of life. Menlo Park, CA: Benjamin/Cummings. Mayr, E. 1996. What is a species, and what is not? Philosophy of Science 63:262–277. Meyer, A. 1990. Ecological and evolutionary aspects of the trophic polymorphism in Cichlasoma citrinellum (Pices: Cichlidae) Biol. J. Linn. Soc. 39: 279-299. Wiley, E. O. 1978. The evolutionary species concept reconsidered. Systematic Zoology 27:17–26. This page was last modified on 14 April 2011, at 19:01.